I've known David Lasky since right after I moved to Seattle in September 1994. He is one of my favorite comics people. He's also one of the most talented cartoonists of the very specific "post-alternative" generation that started putting out first works between 1992 and 1998. Lasky has under-published since his one-man anthology Boom Boom, or at least to my mind hasn't put out work at a rate that matches his considerable skill as a comics-maker. 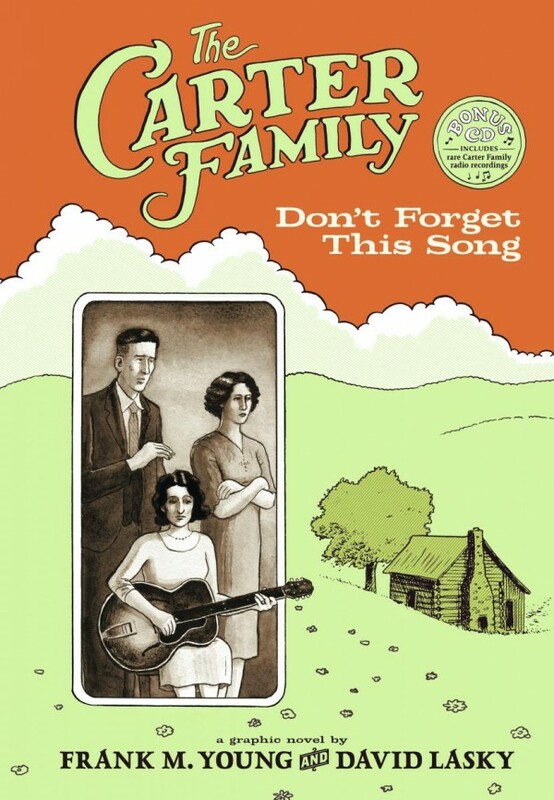 I was therefore thrilled to hear he was working on a biography of the Carter Family, which recently saw formal release as The Carter Family: Don't Forget This Song. Carter Family co-creator Frank M. Young, in contrast, I barely know at all beyond enjoying his writing about comics. Young's lively but short run as Managing Editor of The Comics Journal was my model when I came on board a few years later. One thing I didn't know about Young is that he's an artist as well as a writer, and handled both occasional breakdowns and all of the coloring in this new book. TOM SPURGEON: I'm very fond of the initial sequences of the book, how you portray the AP/Sara romance and eventual wedding. How did you decide what the initial part of the book would encompass, how much of that story to tell? DAVID LASKY: It was a lot of trial and error, figuring out what would fit, and also verifying what was accurate and what wasn't. The Carters' history is largely an oral history, and facts were hard to nail down. We had a sequence in which AP travels to Detroit to work as a carpenter, but then later learned that it was not considered accurate by the family. YOUNG: We had to be selective about what was shown, and when. Some nice little details and anecdotes had to be left out. In the first act of the book, it was important to get a strong sense of the world in which these people lived. It moved at a different pace from the one we know and live in. The atmosphere has to sink in for the reader; he/she needs some time to relax into it. I was impressed at how Ang Lee did this in his Civil War movie, Ride With The Devil. He drops the viewer into a bygone culture, and lets them get acclimated to its differences in speech, dress and behavior. We didn't have the luxury of space and time of a movie-maker. We did have comics' unique way to conflate time and space. We chose moments that set a mood and embraced our cast of characters -- people who have absolutely no idea what is about to happen to them. SPURGEON: Why this bigger splash page here, with a bunch of characters, after so many more Sunday-Strip like sequences? YOUNG: The wedding of AP and Sara is a big moment, in both their lives and in the lives of their community. We wanted to show how close-knit and supportive this rural community was, and that no event, big or small, went unheeded. LASKY: Many of the people in the scene are actual family members and neighbors of the Carters. Some will reappear in the book, and some won't, but we wanted to give a sense of the community that is always around them. YOUNG: This sequence is faithful to the conventions of classic newspaper comics. Many strips had special large panels to denote unusual or important events -- from Barney Google to Prince Valiant. In a sense, this scene is more like a panel cartoon, with the chain of comments from the attendees of the wedding party. It was a great way to show the reader how AP and Sara are regarded by their neighbors. It's a spectrum of reactions, from scornful to admiring. SPURGEON: So I guess it's not off base to suggest that the basic style employed is reminiscent of old newspaper strips. Did you formally work on the style of the book, how it was to be portrayed? LASKY: It's not off base at all. YOUNG: That was imbedded in the project from day one. LASKY: We were going for the look of old newspaper comics from the 1920s and '30s. Frank and I are both huge fans of old comic strips, and for this book we were thinking especially of Frank King's Gasoline Alley, Harold Gray's Little Orphan Annie, and Roy Crane's Wash Tubbs. The idea was to evoke the times when the Carters lived by telling their story in the style of the comics of the era. 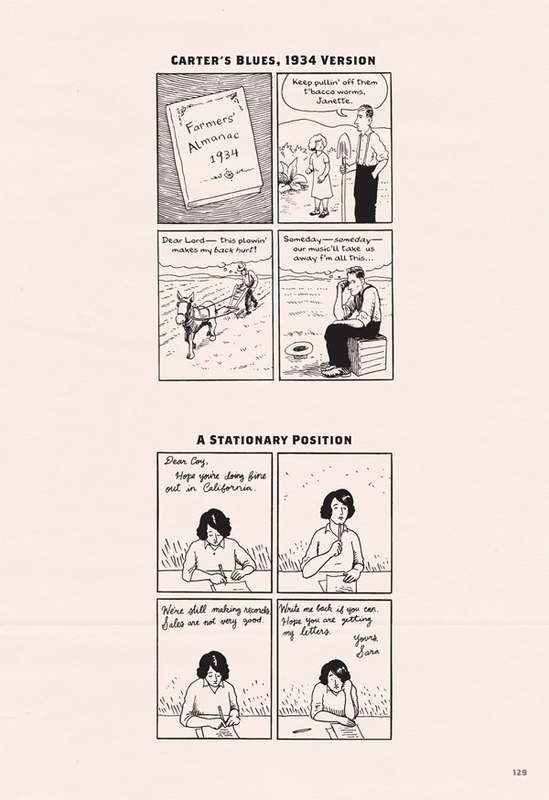 YOUNG: The Kramers Ergot piece, from 2002, was done in a conscious affect of the Harold Gray Little Orphan Annie style. David's own personality as an artist is much more visible in the finished book, and the affect is more of a general embrace of the overall classic newspaper cartooning style. LASKY: Originally, our plan had been to imitate a different comic strip every few chapters, and follow the history of American newspaper comics. You can still see that on the opening page which is kind of reminiscent of a Hogan's Alley page. Our editor wondered why we wanted to change styles throughout the book, and it occurred to me that I had enough on my plate without having to worry about adapting a new style every few chapters. So I settled on a single style that was my own way of drawing kind of pushed in the direction of Frank King and Harold Gray. 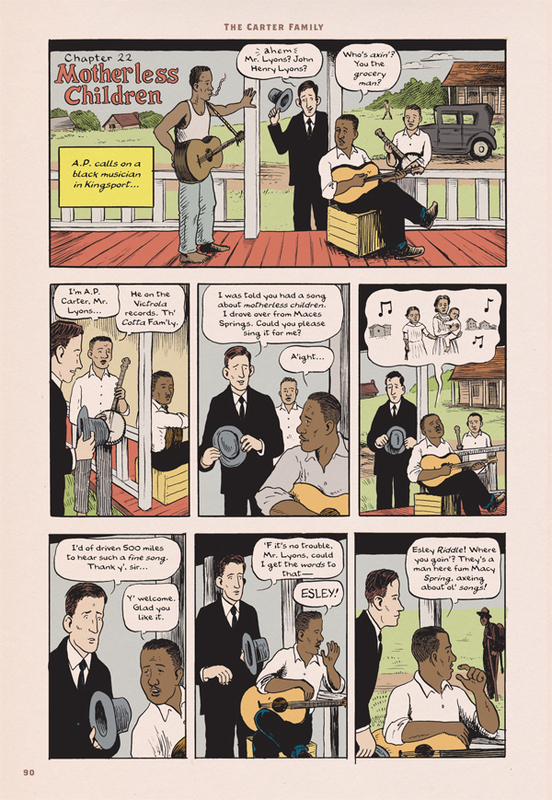 YOUNG: Comic strips and country music are uniquely American products, and it just seemed to work well to tell the story this way. The more deliberate pacing and framing of the early comic strips suited the atmosphere and characters. It was a tough discipline to meet. In our thumbnail roughs, I kept drawing close-ups of the characters, when most comics of the early 1920s favored long shots and full figures. I think that the artists of the time understood they had these giant sheets of newsprint to themselves, and they wanted to take advantage of the largesse in that way. You don't see close-ups in newspaper comics 'til the later 1920s. I think Roy Crane may have been the first comic strip artist to use the close-up as a dramatic device. George Storm did it, too. By the 1930s, long shots are less common. After WWII, when strips began their slow slide to oblivion, smaller print sizes made the close-up more of a storytelling necessity. SPURGEON: How did you two meet? How is that you started working together? Can you talk about the decision to do this project, and how the whole thing came about? YOUNG: I moved to Seattle in 1991, to work for Fantagraphics. I believe David came to Seattle in '92. The comics scene here is very close-knit, so it was inevitable that we would meet. LASKY: I was introduced to Frank by our mutual friend, Kathleen Bennett, back when he was editing The Comics Journal. We had a lot of mutual friends in the Seattle comics scene, and would meet up at parties and such. YOUNG: I liked David's work from the moment I first saw it. He had seen some of my cartooning and responded to it. We kept in touch, hung out occasionally, talked about comics, and when he asked me to join him on this project, I immediately said yes. I was quite honored, in fact. It was a long succession of brief meetings, prior to the inception of the project, but I instinctually felt that it would be rewarding to work with David. LASKY: One mutual friend, Ilse Thompson-Driggs, was pregnant in 2002, and was playing CDs of all different kinds of music for her baby in utero. She played an album of hillbilly music, and mentioned to me that I should consider making a comic about hillbilly musicians, that there were probably some good stories there. I immediately thought of the Carter Family. I loved their music, but knew very little about them. Ilse and I both thought that asking Frank would be a good way to learn more, because he knew a lot about old American music. I got in touch with him, and it turned out he knew a lot about the Carters, and had even written an essay about AP Carter for a literary magazine. He told me a lot of great anecdotes, and I immediately asked him if he wanted to collaborate on a comic. We made a 10-page comic for Kramers Ergot #4. Frank and I wanted to story to be in color, to evoke old comic strips, and by serendipity, Sammy Harkham had offered me a place in his new anthology, and said color was not a problem. Most publishers shied away from color, because of the expense, so this was very exciting for us. 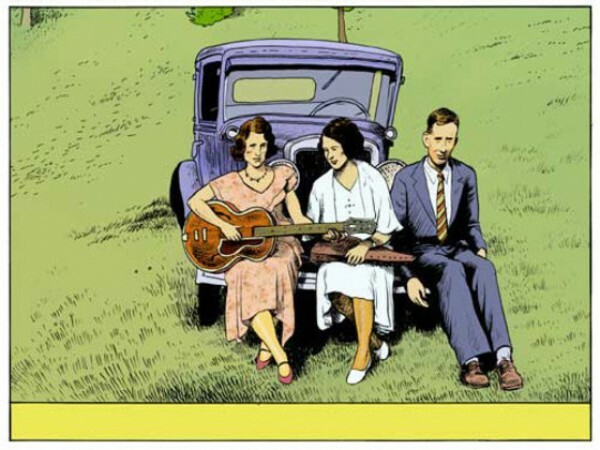 While we were working on that comic, a full-scale biography of the Carter Family was released -- Will You Miss Me When I'm Gone? by Mark Zwonitzer and Charles Hirshberg. That book collected well-known stories and also revealed some new information about the trouble in AP and Sara's marriage. Frank and I realized that there was a lot more story to tell. SPURGEON: Dave, this is a couple of pages that you chose, and I wondered what intrigued you about them that you wanted to discuss them. They're not exactly showy pages, and in fact, they're kind of dense with little sequences. LASKY: I wanted to look at some incidental moments and talk about how they add up to tell the larger story. The facial features and body language tell the story as much as anything else. I like the fact that there are panels in this spread where we stop using words and let the picture tell the story. Page 46 begins with AP asking Sara to come record at Bristol, and her reaction shows that she is not crazy about the idea, but she still loves him and will do this thing because it means a lot to him. SPURGEON: There's a lot of humor here -- maybe most noticeably a joke that is held as funny by the character and then kind of an extended sequence where we see Maybelle needing to pee a great deal. How important was it for the two of you to work in humorous sequences? Did you have any problem understanding the sense of humor on display from the various characters? YOUNG: The story of the Carter Family's life and career is, essentially, tragic for AP and Sara. Maybelle seems so stable and well-balanced, in contrast. She had a good relationship with her husband, Eck (AP's brother), good money coming in regularly, and creature comforts. AP and Sara's marriage, in contrast, seems a constant struggle. A lot of depressing things happen to them, especially in the middle section of the book. The impending failure of their marriage hangs heavily in the air. However, life offers us a constant buffet of comedy and tragedy. I particularly love the mixture of these elements. A movie like Terence Malick's Badlands has a beautiful blend of these two flavors of life. It's a great storytelling tool, because any reader can relate to the chaos of existence. There was no room for broad comedy in the book. Many times, I suggested something broader, and David would laugh, but say that it was "too over the top." Still, there were a wealth of quirky incidents and character traits to choose from. There's an incident on p. 105, in which Sara entrusts her two youngest children to the care of local eccentric Brown Thomas. She returns from an errand to find Thomas asleep on the job, while her kids race around the yard, coated in mud, playing at Indians. Joe Carter, the original streaker, is buck naked. Seven pages later, there's a call-back to that moment that I find quite funny. Even amidst the bleakest of circumstances, there is still humor in our lives. I wanted our book to reflect this. LASKY: We knew there would be plenty of sad and depressing moments in the book, and we wanted to inject humor wherever we could. We were told by a granddaughter of Sara and AP, after she'd read our rough draft, that we were making the book too serious, that the Carters were people who, aside from singing sad songs, could laugh and have fun at times. So I felt an obligation to show different sides of their characters. Maybelle was pregnant when she went to Bristol, so what comes across as humorous in the scene, stopping to pee (or get sick), was probably not so amusing at the time. Filtering the story through the lens of Frank King made some of these moments more "gentle" than they would have been if Frank and I had drawn them in our own style. King almost always drew his characters at a distance, as if they were being seen on stage -- all the old comic strips did this -- and that does something to the tone of the story. SPURGEON: Dave, can you talk about the storytelling flourish you use on page 46, second tier, with the continuation of a background over two panels? Why that effect there? LASKY: It was a way of showing that Maybelle enters the room in the middle of the conversation, and misses out on the context of it. It also shows, maybe a little subtly, that Maybelle and Ezra live in a larger, more well-furnished house than Sara and AP. Their living room occupies two panels instead of one. SPURGEON: There's a lot of travel in the book, a lot made of the distances that separated people in this time period -- something that we might not think about now. Is it fair to say that it was a bigger country then? As some of the first broadcast celebrities, was how that celebrity status kind of move across these distances of interest to you? LASKY: The drive to Bristol takes around 20 minutes today, on the paved roads in the area. Back then, they were on muddy dirt roads with deep wagon ruts, they were fording the Holston River. It was an all-day trip for them, and much of America was just as unpaved at the time. One of the things that really appeals to me about the Carters' music and their story is that they are coming out of the 19th Century (or in some ways the 18th) and transitioning into the 20th Century. The journey to Bristol, and the fact that its details were remembered by them and their daughter, expresses a lot about the world they were coming from when they started making records. Sara Carter really didn't like to go on tour, and AP was not always such a great driver. Being broadcast celebrities on border radio completely circumvented the need to play from city to city. They were suddenly being heard across the country, from Texas to Canada. It plays a part in their real-life story, when Sara sends a message, on their show, to her estranged lover in California. And it also expresses the jump into a new age, where songs once played for family members in the parlor are now being heard live by millions of people. SPURGEON: How much technical research did the two of you have to do to get buildings and cars right? How exacting was your research in that area of things? Was there anything particularly difficult in terms of the research you did for the visual aspect of the book? LASKY: We had a shelf of reference books we would refer to, plus many web searches, and visits to the Seattle Public Library. I don't come from their time or place (though I am from the other end of Virginia, the D.C. suburbs), so I was self-conscious about making log cabins look accurate, getting the cars and the landscape looking somewhat correct, etc. I still made mistakes, but at a certain point, you know, just had to let go. Back in 2002, I traveled with my father to the Carter Family Fold, a concert venue built on land once owned by AP Carter, where his kin still reside. It was important for me to really be there and see the mountains and the fields of the area. I got to listen to the way people talked and made jokes. I wasn't what you'd call "immersed" or anything. It was only a two-day visit to Bristol and Hiltons. But I think it did make a difference when I sat down to draw the book. I had the hardest time drawing horses. I almost never draw horses in my comics usually. I asked Roberta Gregory for help, and she very kindly gave me a tutorial in horse drawing. And when the book was under way, gave me feedback on the panels with horses in them. Old cars were much easier. There are tons of photos of vintage autos on the Internet. SPURGEON: This is a quietly I think powerful sequence where we see AP out researching songs, hearing songs from different people. Can either of you talk about this practice. Was he actually wholesale taking songs from people that were out there? Was he using the songs to inspire his own work? What exactly was going on here? YOUNG: AP felt it was important to save the old songs he heard around him from extinction. He had no idea where these songs came from. He just assumed they were old, as he often heard older people sing them. There was no practical way to save them, except to write them down and remember them. Many of these songs were derived from Anglo-Saxon ballads going back hundreds of years. But many of them were Tin Pan Alley popular songs of the 19th century. AP had no way of knowing who first wrote them. He just documented them, and later arranged them so that they'd fit on one side of a 78 RPM record. Unquestionably, AP added something important to any song he adapted. I don't think it was ever his intent to claim he'd written any of them. Only through the insistence of his manager, producer and music publisher, Ralph Peer, was AP's name attached to these songs as composer. A more fair credit for his work might have been "Public Domain -- arranged by AP Carter." But Peer knew there was money to be made from copyrighting these works. AP did compose some original songs, which we show him doing in the book. He was wholly sincere in his musical efforts. LASKY: This was still the early days of the music industry. So to the average person, songs were "in the air" and not really owned by anyone. AP found songs, found lyrics, and then he worked with them. Sometimes making changes, sometimes not. It's not so different from Led Zeppelin doing their own thing with "When the Levee Breaks," which was originally a blues song by Memphis Minnie. I think it comes natural to musicians to "find" songs and adapt them. What becomes controversial, for the Carters -- and for Led Zeppelin -- is that songs are copyrighted, and music copyrights would evolve into a big business by the middle of the 20th century. In AP's defense, he and Sara and Maybelle made timeless classics out of songs that would most likely have been forgotten otherwise. SPURGEON: This is pretty tight grid. Who was primarily responsible between the two of you in deciding pacing on the page? How much back and forth did you have in terms of how a page might be structured -- how detailed were your script in this area, Frank, and did you have to go back and script differently than how you intended in this scene or others like it. YOUNG: The grid was largely dictated by our limited space, and by wanting to cram as much into these pages as we could. LASKY: We divided up the labor on drawing thumbnails for the book. Frank thumbnailed this chapter, deciding what would happen in each panel. I then drew a detailed rough, at the size the page would be printed. There was a lot of back and forth in developing the rough. One major change was that a whole page was removed, in which AP asks a banjo player for directions to the house of a blues musician. Because we had a limited page count, and needed to boil things down to just the essential story, this was a page that was deemed expendable. So the chapter begins with AP and the banjo player approaching the house. In making the rough, I kept most of the actions the same, but changed a few of the shots to keep the staging consistent. Where Frank has a close-up, I pulled the "camera" back to a two-shot, to preserve the feel of 1930's comics, where close-ups are actually quite rare. YOUNG: Our working method was to first write up a general description of what would happen -- like a treatment for a movie project. Then, David and I would divvy up chapters and draw rough thumbnails. These confirmed that our narrative would work in comics form, and help us determine if a sequence was too long -- or not long enough. At that point, David did a series of pencil versions, getting closer to the final tight pencils for the finished art. From these more detailed sketches, I would write basic dialogue. I knew it wasn't the final iteration, but it needed to convey what the characters saw, felt, said and heard. Once the line art was inked, it was scanned and assembled into page form. David usually worked one tier at a time. After I colored the page, I wrote the final dialogue, which I kept revising until I couldn't anymore. David would sometimes have to re-draw speech balloons to admit more words. For the most part, I challenged myself to make the dialogue fit the balloons. I loathe expositional dialogue, and I strove to keep it out of the book. Moments from the book were cut, shuffled, re-inserted -- late into the book's creation, pages were revamped. SPURGEON: There's a lovely visual flourish here where you communicate a song's meaning through a picture rather than the lyrics? Whose idea was that? What do you think you achieve there? YOUNG: Credit for the creation of these memes must go to David. It was his inspired solution to the sad fact that we couldn't quote from the song lyrics, due to legal complications. I think these visual representations of music work really well -- better than it would have been to quote the words. They are symbols of the beauty and expressiveness of this rich music. LASKY: When we were starting out with this book, we were told by an expert in the music biz that the Carter Family's songs are no longer copyrighted. This expert, it turned out, was wrong, and I think the problem was that he had worked on the Carter Family's music in Germany, where, thanks to German copyright law, the Carter Family's catalogue is in the public domain. So Frank and I had written all kind of lyrics into the book, and we found out that we were not able to legally use them. We fell back on using song titles where we could, but in certain spots, the song title wouldn't suffice. My idea in this chapter was to illustrate scenes from the songs inside the word balloons. I liked that it communicates something about the song, and the reader doesn't have to know the melody or lyrics to get a feel for what is being sung. I was inspired by Megan Kelso, who wrote, I think in Queen of the Black Black, a little about how she challenged herself to find ways of depicting music in her comics. She went well beyond just drawing a few musical notes in the air and really got inventive. SPURGEON: Can either of you talk about the middle panel on page 91 -- I'm fascinated by the fact that you go to a monochromatic look with the figures. What does that do to the page, to the sequence, do you think? 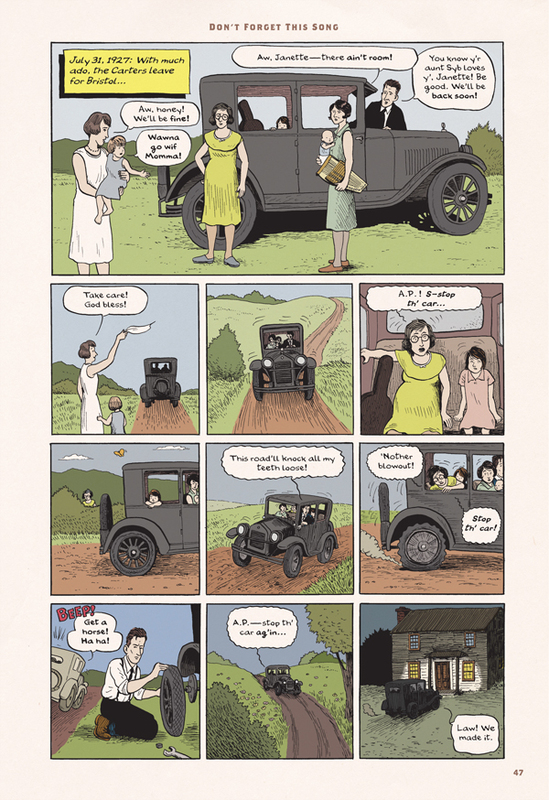 YOUNG: It's the center panel of a nine-panel page, and it shows the moment in which AP Carter and Lesley Riddle connect as kindred spirits, friends and collaborators. Those colors suggest, I hope, that in that moment, nothing else matters but the music, and the powerful effect it has on both these gifted men. I saw it as the focal panel of the page, and wanted that to be keenly felt. The intent was to draw the reader's eye to that crucial panel, and it had to stand out from the crowd. SPURGEON: This might be more Frank than Dave, but I'd love to hear from either of you. Can you talk about Lesley Riddle a bit more, who he was and how important he was to the Carter Family story. How did you determine how he was going to be treated in this work? How much time did you want to spend with his story? LASKY: Lesley was an aspect of the Carters' story that makes it kind of universal to all American music. He was a bluesman who had his material appropriated and made commercially palatable for a white audience by white performers. Recording African American songs for a white audience is what Elvis did, it's what the Beatles and the Rolling Stones did early on, and it still goes on today. Frank told me about Lesley Riddle early in our conversations about the Carters, and I was immediately fascinated. It's no accident that Lesley is a major character in our Kramers Ergot "pilot episode." I was relieved to learn that although the Carters appropriated songs he had taught them, sometimes songs he had written himself, they were kind to him and provided him with a prosthetic leg and a kind of surrogate family life for a while. While I wouldn't call the Carters "activists," they were definitely not racists either. They were progressive, considering the times they lived in. We invented a sequence in which AP tries to give Lesley a songwriting credit and when Ralph Peer refuses, they buy him the artificial limb. We know that they bought him a leg, and that he felt they were "just like family," but the rest we invented. We wanted to resolve the fact that they had used his songs but at the same time had paid him "in kind." So that's why we invented the confrontation between AP and Ralph Peer. In reality, we just don't know what happened, and there's no one around to ask. YOUNG: Lesley is a major player in the Carter Family story. AP's relationship with Lesley was fascinating for me. It showed that there were pockets of cultural tolerance and acceptance in the South of the 1920s and '30s. AP did exploit Lesley's talents to an extent -- the Carters recorded many of his songs, but Riddle couldn't be credited, according to Ralph Peer's business practices. We try to show that AP and Lesley were both aware this was a flawed situation. But some of the Carters' finest recordings came from material Lesley brought to them. His influence really adds soul to their singing and song choices. Some of their late-Depression recordings are remarkably blues-gospel flavored. That's Lesley's touch showing through their Caucasian/Protestant structure. I got the sense that AP and Lesley truly liked and respected each other. It was rare for the times, and the general area, but it contrasts with our vision that the South was an entirely segregated, racist place. SPURGEON: Why this several-page sequence of four-panel, black and white cartoons? Why this very specific, formal break? LASKY: This is, dramatically, the end of Act Two -- the point where things are looking the bleakest for our characters. It's also a very bleak point in The Great Depression. So it made sense to drain the color from the pages. As you might guess, we're attempting to give the reader a sense that they have been reading Sunday comics page reprints and are now being shown a selection of daily strip reprints. Originally there were to be five strips per page, but that felt too claustrophobic. So we went with the four-panel grids instead. YOUNG: It was as much a necessity as an experiment. The period of time this sequence covers -- 1934 to 1937 -- wasn't the most eventful of their career. Many little things happened. The sum total was something significant, but it wasn't something we could devote 30 or 40 pages to depict. The idea of doing daily newspaper-type sequences with the Carters was something David and I had played with before. This seemed the best way to get these little bursts of information into the fabric of the book. SPURGEON: There's a lot of story stuffed into these kind of arch sequences. You touch on Sara's major romance with Coy here; that seems like a remarkable turn of events in terms of the family saga. What did you want to communicate about that development in general? Were there other elements of drama that you avoided at all, that you left out? YOUNG: The romance of Coy and Sara is already established in the previous color section of the book. These "daily strips" spell out some of the grimmer details -- AP's refusal to forgive Sara, and the divorce that follows. The vignette quality of these four panel strips gives each of these moments a certain power. That edge might have been dulled if these were part of an episodic, connected chapter. It was also fun to come up with those arch, punny headline titles for each strip -- as daily strips of the period had. LASKY: There was just too much story to cover and a limited number of pages, so we jettisoned a lot of the incidental things we'd written and focused on what needed to be told. 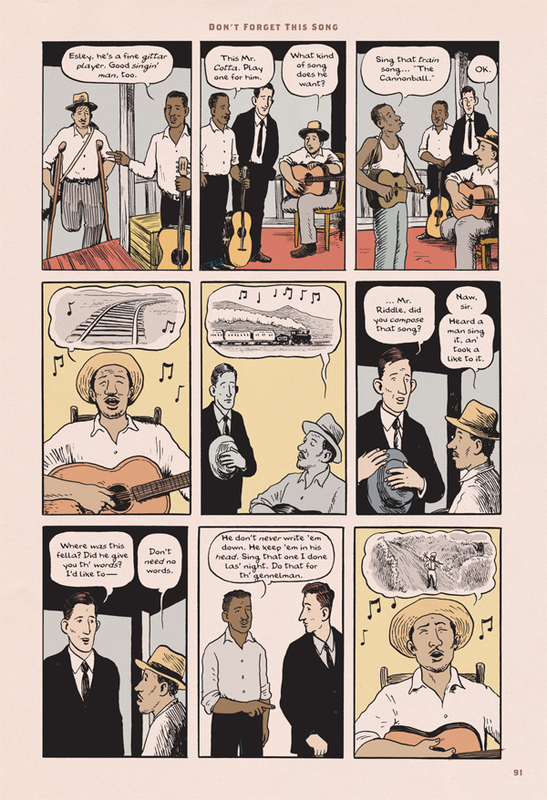 We had wanted to show a little more of side characters like Doc Brinkley and Jimmie Rodgers. I wish we had been able to say a lot more about Maybelle and her family, but AP and Sara are really at the heart of this book. SPURGEON: You end this book on a very mournful sequence of pages, where we see the group kind of transform from one generation to the next, and from a recording sensation to a kind of primarily -- and maybe I'm wrong here -- touring/live performance phenomenon. How hard was it to find an ending? LASKY: At first it was hard to determine where in their history to end our book, but realizing that AP is our main character, it seemed clear that his loss of Sara and loss of the original Carter Family trio is where the story ought to end. He did many interesting things in the last 20 years of his life, but his fame and the realization of his ambitions never came back. He never remarried either. YOUNG: The break-up of the original Carter Family, and the separation of AP and Sara, by divorce, re-marriage, and relocation, seemed to us both to be the place to bring down the curtain. There's more to the story of AP, Sara and Maybelle, but their original working relationship was never the same. SPURGEON: What would you have people take away from the story? I know that's a terribly blunt question, but I wonder in general how you view the overarching narrative. Is it a family story for you? A study in American entertainment? A personal story? I'm struck by the tree metaphor, which seem very simple but very strong. YOUNG: It celebrates the American Dream, but it also exposes its dark side -- that you can pursue your ideals, but that pursuit can screw up other, equally important, things in your life. It also shows how self-reflexive our culture is, and always has been. Intellectual property has become a sort of renewable resource. Things go in and out of fashion, of importance, but they always weave their way back into the fabric of the world. Just as AP Carter rescued 19th century Tin Pan Alley pop songs, old hymns and ancient ballads, and made them commercially viable to a mainstream audience, old songs, novels, movies, comics and ideas keep coming back into relevance and acceptance. America moves forward and backward constantly. This tension of past, present and future is the vital energy of our culture. It's what made the Carter Family significant in the 1920s and '30s, and what keeps them compelling to us in the 21st century. LASKY: I see this as a story about America, told through its music -- the blending of races and cultures, the potential for wealth, the triumphs and tragedies. But it's really up to the reader to decide. Trees were already in the real-life story, but the apple tree metaphor was something we invented. It's artistic license. We borrowed from the Book of Genesis, sure, but when I was growing up in the D.C. suburbs, my parents would drive my brother and me out to the moutains in the fall and we'd take home a big sack of apples from a roadside stand. So for me, apples and Appalachia go hand in hand. SPURGEON: You might decline to answer this question, but can you talk about the journey of this book? This has been in the works for years and years, and there are all sorts of rumors out there that you had a difficult rights battle. What can you tell us about how that resolved itself? How glad were you to finally see the book printed? LASKY: I'll just say that it was a bigger and more difficult job than I'd ever anticipated. But when I saw the first advance copy of the book, I immediately felt it had all been worthwhile. YOUNG: Ultimately, we ended up not really needing the song lyrics. Our attempt to acquire them slowed down our work on the book. I'm glad we found a creative solution to the whole rights issue. One song that was important to quote was "One Little Word," an 1899 popular song written by Gussie Davis. I found the original sheet music to the song, and we thus established provenance that AP didn't write it. His performance of the song, on Texas border radio, is one of the most moving recordings I can think of. His singing says so much about what was going on inside at the time. I'm glad we were able to include that performance on the book's CD. You've seen the video in which David and I see the book for the first time. I think that says more about how we felt than I could in words. It's still such a kick to see the book in stores, and to hold it in my hands as a real three-dimensional object, a part of the world. It's a beautifully produced book; it has real heft. SPURGEON: This is a very comics sequence, with a lot of the subtleties of transition that comics provides. Other than the fact that it's how you guys work, your chosen form of expression, what do you think the strength of comics has been in telling this particular story? 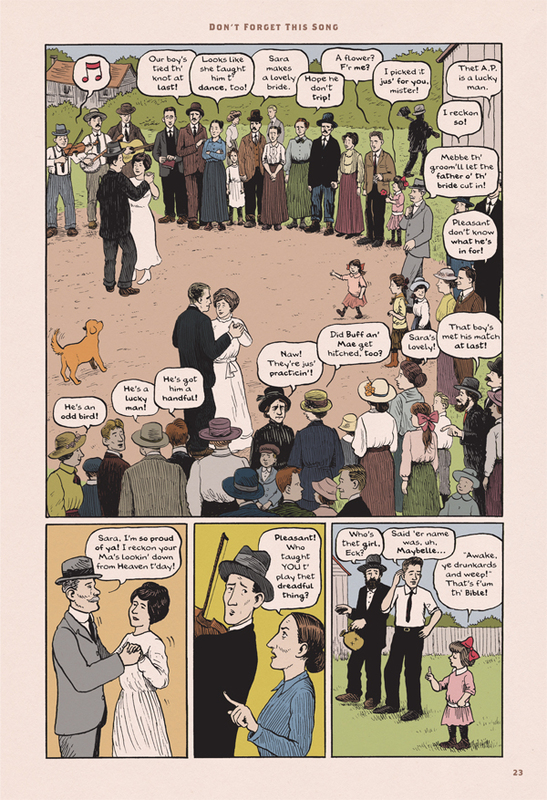 What about comics lends itself to biography, to a recollection of music? YOUNG: The blend of images and words is ideal for biographies. The comics form can engage a reader and help immerse them in the world of the story's subject. Unlike a movie, which whizzes by at 24 frames per second, a comic is controlled by the reader's focus. If they want to turn back and reference an earlier event, it's just a riffle of pages. This rapport with the reader is something they can also get in prose, but I think the images add something significant. It's almost like being able to look at old photographs that pertain to the narrative as you read the story and take it in. Music is a tough thing to evoke without music itself. Going beyond floating quarter notes, and showing the images that music touches in our heads, is tailor-made for comics, I think. I think that, as Americans become more comics-literate, we'll see a lot more historical/biographical material in graphic novels. The more comics can embrace aspects of the world, and show people that they can relate to them in a real way, the more willing the average person will be to read them. LASKY: We knew the book would end with AP walking and talking to himself. 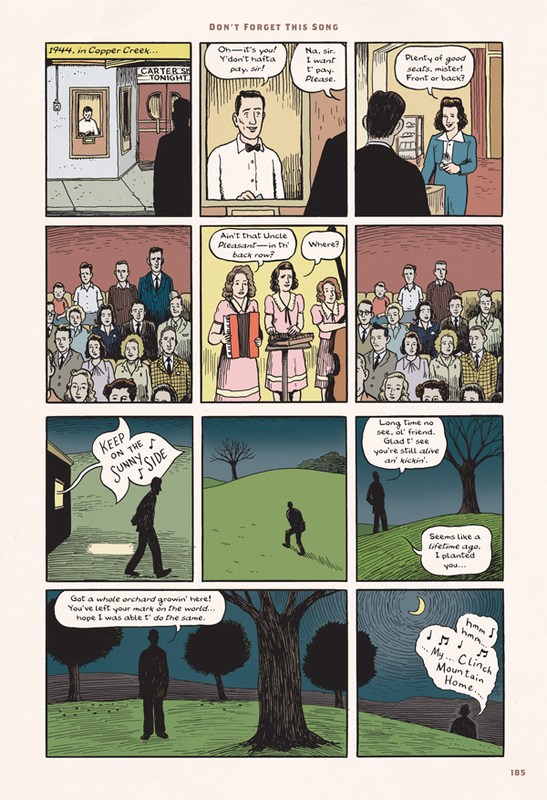 We added the scene where he is at a concert and "disappears", based on something I think June Carter remembered. Looking at it now, I realize we were symbolically making him disappear from performing and from the book itself. But at the time it was all done intuitively. The definitive prose biography of the Carter Family is Will You Miss Me When I'm Gone?. It collects a lot of the oral histories that existed previously, and adds new oral histories from sources previously overlooked. 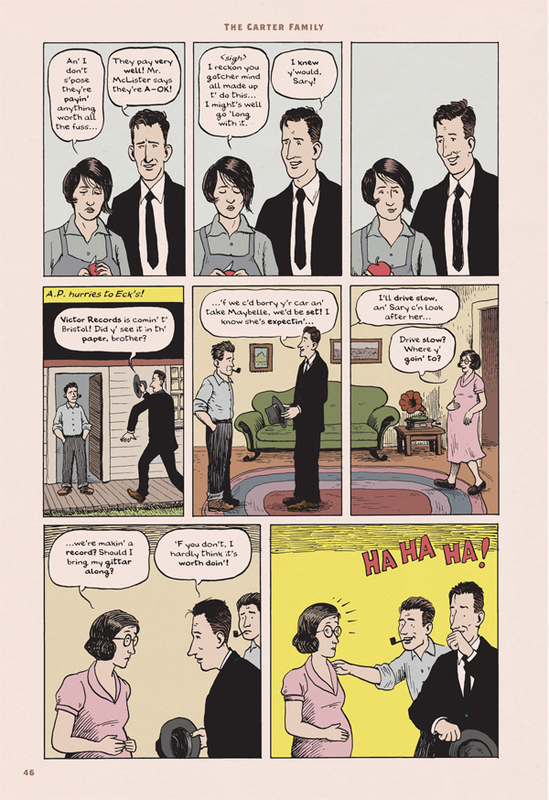 With our book, I think we wanted to use comics to basically "show, don't tell" -- to transform the detached and sometimes conflicting oral histories into something more visceral. To put the reader into the landscape, into the country that is called forth by the music. * The Carter Family: Don't Forget This Song, David Lasky and Frank M. Young, Abrams, hardcover, 192 pages, 9780810988361, 2012, $24.95. * the images are pretty clearly contextualized because of the format of the interview; the top image is of course the cover, and the bottom I believe appeared on the Kickstarter campaign via which Lasky and Young completed the book when it hit a snag.